Twist, turn, and scan. 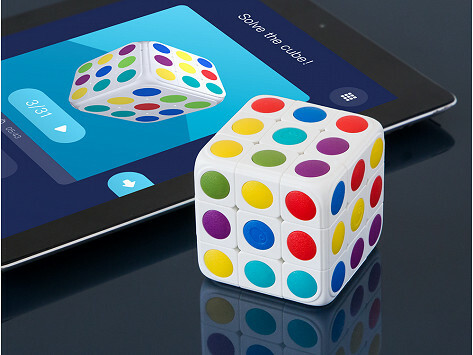 This smart cube puzzle is an app-connected game that guides kids to have fun as they learn. When they hit a roadblock, they can scan the real-life cube into the app to get some pointers. Cube-Tastic! is a playful coach that enhances their logic, memory, and critical thinking skills. Dimensions: 3.4" x 3.4" x 3.4"
My Great Granddaughter loves it. I'm thinking about giving this to my daughter who teaches at a deaf school. It looks like it may be a fun challenge for the students to do independently. Tedious instead of fun. One star because it is well made. 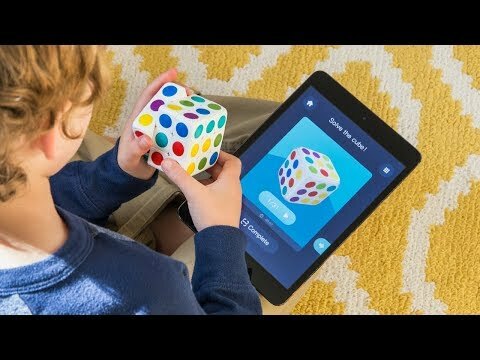 Even a four-year-old can solve this app-connected, smart cube puzzle. And they’ll learn a bunch in the process. Cube-Tastic! is an app-connected puzzle that’s part game, part coach. It scans the real-life cube into the virtual world to help kids solve it. This enhances their logic, memory, and critical thinking skills. Roadblocks are suddenly learning opportunities—an incentive to keep trying. As the player becomes more skilled, the game offers alternative problem-solving methods that boost their agility. The more they play, the faster they get. Kids will like the challenge, and parents will appreciate screen time that’s educational.